The Middle East, Africa, and Asia now drive nearly all global energy consumption growth | Watts Up With That? 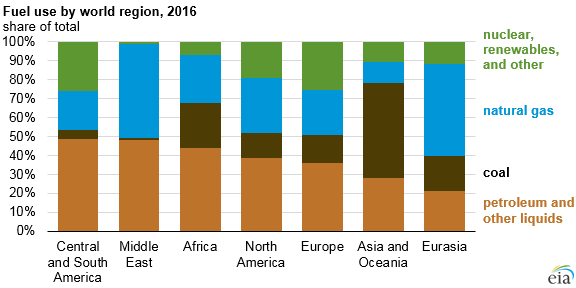 Energy consumption in Asia, the Middle East, and Africa continues to grow rapidly, with about 20% growth in each region between 2010 and 2016, according to newly available data in EIA’s International Energy Statistics database. In particular, energy consumption has been increasing in the Middle East and Africa, driven by economic growth, increased access to energy markets, and quickly growing populations. Energy consumption in Asia grew even as energy consumption in China declined between 2015 and 2016. Although growth was rapid in Africa and the Middle East, Asia and Oceania consumed much more energy overall (42% of 2016 world energy consumption, compared with 6% in the Middle East and 3% in Africa). Slower long-term energy consumption trends continued in the mature economies of North America, where energy consumption grew by 1% between 2010 and 2016, and in Europe, where energy consumption actually fell 4% between those years. Globally, petroleum and other liquid fuels (including biofuels such as ethanol and biodiesel) are the most prevalent form of energy consumed. Growing use of these fuels has been supported by increasing supplies of U.S. shale oil and other international sources of liquid fuels that have kept prices relatively competitive. Global coal consumption continued to decline as a result of competition from low cost natural gas as well as some countries’ policies to limit or decrease coal use. Regional fuel use varies according to the availability of resources. In 2016, coal accounted for almost 50% of the energy consumed in Asia and Oceania, where China, India, and Australia are all significant consumers of coal. The largest shares of nuclear and renewable energy were in Europe (26%), North America (19%), and Central and South America (26%). These regions, particularly Europe and North America, have significant renewable resources as well as policies that encourage renewable energy usage, especially wind and solar. Because of the region’s rich reserves of oil and natural gas, nearly all energy consumption in the Middle East comes from either petroleum or natural gas with virtually no contribution from coal, nuclear, or renewable energy. From 2000 to 2013, China experienced rapid growth in energy consumption, overtaking the United States as the world’s largest energy consumer in 2009. Since 2013, China has consistently used approximately 40% more energy than the United States. Although growth in China’s gross domestic product (GDP) has slowed over this time period, it continues to grow faster than 6% per year compared with relatively flat total energy consumption, demonstrating the country’s improvements in energy intensity (GDP per unit energy). By comparison, India’s GDP is growing at a rate of almost 8% per year, and energy use is growing as well. In recent years, India has surpassed Japan, Canada, and Germany in energy consumed. As more recent data become available, India is likely to surpass Russia as the third-highest energy consuming country. Detailed country-level data on energy production, consumption, and transport through 2016 are available in EIA’s International Energy Statistics database. Natural gas data, petroleum supply data, GDP, and population are available through 2017. 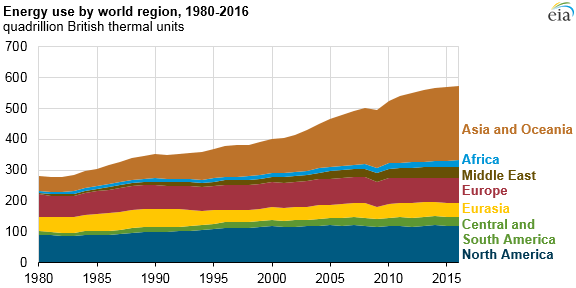 EIA Country Analysis Briefs supplement the International Energy Statistics database with key information on energy production and consumption trends. 1 – When will China feel it necessary to save the planet by cutting back on fossil fuels? 2 – How much global warming will be averted by the developed countries cutting back on their fossil fuel consumption? 3 – Given 1 and 2 above, why do any people think it’s a good idea to wreck our economy by trying to mandate windmills? Their goal is world wide socialism….AKA….One World Government….period…. Now, I have a genuine question about the concept of a one world government. Where does one go for sanctuary the moment that utopian dream turns nasty and it insists I wear a symbol or some other marker because I don’t fit in for whatever reason? You have to go off-planet. Their plan was to get us to pay them while they get us to wreck our own economy. Paris agreement? And as soon as democrats get in charge again, or idiot republicans, we’ll be right back at it again. There are plenty of Obama’s waiting on the wings. Pray for Trump and what conservatives we have left. 1 Never. They do not care about what white devils think. 2. Infinitesimal. So small as to be unmeasurable. 3. Because they want to wreck the economy. Men intned the natural and probale consequences of their actions. It is the desire of the warmunists to impoverish, demoralize, and humiliate the deplorables of flyover country. Their hearts soar when they hear about the massive increases in suicides and overdoses. Men intend the natural and probable consequences of their actions. It is, as U.N. and IPCC spokespeople have stated, to end the Industrial Economic model that has prevailed since the mid 19th century; To fundamentally and permanently change the way in which developed economies function using means that avoid having to ask for or obtain democratic consent. Climate Change, aka Global Warming, is the means created to try and achieve this – as some UN/IPCC “luminaries” have publicly admitted. The intent is to replace the western economic and politically democratic systems with a socialist marxist style of global economy prescribed and controlled by the unelected and unaccountable through a global government. Many in the UK view the way in which the EU has steadily, stealthily and deceptively accreted law and policy making powers to an unelected and unaccountable elite as a test bed for changing and ending what we understand democracy to be. Most Brits in the 80s and into the 90s would have considered MPs in parliament to be making decisions and laws as their democratically elected representatives in a fully functioning democracy. Realisation that this was no longer the case and that 80%+ of UK legislation was being dictated to us by “eurocrats” in Brussels emerged as the decades passed and finally led to the Referendum. A decisive vote to restore our national sovereignty by leaving the EU was the outcome. Today we see that the political class in Britain is determined to keep us shackled to the EU by one means or another. The use of scaremongering and the deployment of fake news is their weapon of choice and where that is failing to work they have now shifted to more blatent approaches to frustrate the democratic choice of restoring national sovereignty. To go full circle, those techniques of scaremongering, deception and fake news are all very familiar to climate sceptics. But be very alert for the below-the-radar attempts to subvert and replace democracy, something that the Copenhagen treaty was designed to and would have achieved had if been ratified. Democracy can fight off political challenges, communism and socialism can be exposed for the failures they are, but when democracy itself is turned into a hollow shell by deception to hand power to the unelected then restoring it is very difficult. That is the intent behind climate change and when democracy has been stolen away well …… We are seeing in Britain today just how difficult it is to get that back …….. Thank you. People don’t realise how important Brexit is to democracy across the globe. What raises the difficulty of governing ourselves exponentially is the fact that Society’s main instruments for spreading information to the populace, the news media and entertainment media, have been hijacked by the socialists for their own political purposes and they have managed to create a huge, scary false reality in which tens of millions of people live because they think the Media is telling them the truth. A person can’t vote properly if they are living in a false reality and are divorced from reality. The Leftwing Media propagates lies and is silent on the truth and keeps millions of people confused and afraid, and this is a great, perhaps the greatest danger to our form of government and our personal freedoms..
President Trump’s exposure of the lying Leftwing Media is one of his most important contributions to our nation. I had a long-time friend of mine, who is not particularly political and watches CNN (and I don’t discuss politics with her) told me out of the blue the other day that she would never vote Democrat again after watching how the Demcrats behaved during the Cavanaugh nomination process and now with fighting against securing the southern border. Trump got 63 million votes when he won the presidency. I’ll bet he could get many more millions of votes now.. So how much does virtue signalling by Westerners with wind and solar affect the behavior of Indians and Chinese? Not much? I’m sure it lightens their mood, perhaps even raises a laugh. I wonder how accurately China is reporting its energy consumption. Even increasing energy intensity would not account for a complete leveling off of energy consumption over so many years as indicated in the EIA report (especially with 6% GDP growth per year [not that I trust China to be honest with that number either]), especially given they still build large numbers of coal-based and other power plants each year. Personally, I smell something fishy in their data, unless I’m missing something obvious. The only accurate numbers are the amounts imported. They have to match the exports of their trading partners. The rest of the numbers are meaningless. Ditto. The problem however is not just China’s energy numbers. All of the Green/Left’s ‘calculations’ are dodgy. The Green scams do not include the energy (CO2 emissions) to transport the natural gas. Liquifying and re-gasifying takes roughly 30% of the energy content transported as does pipeline transporting. It is very energy intensive to transport gas. The Green scam, CO2 saving, does not include the CO2 cost to construct the wind or sun gathering systems or to build pipelines and other natural gas facilities or to construct to high voltage DC power lines to transport wind and sun energy to where it is needed. The Green scams CO2 savings does not include the reduction in grid efficiency that occurs to accept on/off up/down/up/down ‘green power’. Combined cycle natural gas power plants are roughly 20% more efficient than single cycle natural gas plants. Combined cycle natural gas plants however take 10 hours to start and hence cannot be turned on/off/on/off/on/off as required if wind and sun is forced onto the grid. “German CO2 equivalent emissions refuse to budge 10 straight years running, despite hundreds of BILLIONS invested in green energies. Witness the reality of trying to convince people that reducing CO2 will save man from extinction. Quite the contrary. As more and more of India’s energy impoverished populace gain access to energy infrastructure, the general usage is bound to dramatically increase. Let’s not forget that India has also sent probes to orbit the Moon and Mars…so they can join with China in adhering to the COP21 Paris restrictions. They can thank Bill Clinton in part for that. China’s rocket industry wasn’t doing too good until Clinton helped them out. I wonder how much Clinton recieved in bribes for that one? I’m sure the Chinese know the amount. And G.W. Bush calls Bill his “brother from another mother”! How ignorant is that! What do he and Bill talk about around the kitchen table? Monica? Bush loves this moral degenerate, and then criticizes Trump for calling people names (which are well-deserved). Bush has his priorities upside down. He ought to be praising Trump and condemning Bill Clinton. It’s a strange world we live in. Frankly I wouldn’t want China, India or for that matter Africa, cutting down on cheep reliable coal-based electricity. We need more civilisation, not less. Instead we in the West should be showing the way building our own clean coal plants and competing with China to help develop Africa. Cheep electricity gives people electric light after dark, hot and cold running water and all the things we take for granted. Good for the environment too. Fewer trees cut down for firewood. Another reason why the Greenist ideology in Australia is useless. But no doubt they will continue to force up this creek without anyway. A single government is like a single phone company. All phones would still be land-line, black, with a rotary dial. No matter how bad the government, if there is no alternative there is no need to improve. Everyone has a job but noone works. Chinese Gov can’t believe their luck. They’ll continue talking up climate goals while doing the opposite. EU socialism is just a convenient long game stepping stone for Chinese control of markets and politics. They should have split out “nuclear” from “renewables and other”. I suspect they kept them together to hide “renewables”. And of course, “renewables” are given first dibs (if and when they are producing) over the other forms of energy that sit waiting to back “renewables” up. Although China is the country with the highest CO2 emissions, the emissions per capita are not that high. Emissions per capita in China is 7.5 ton annually, compared to 16.5 in the US, and 1.7 in India. The average CO2 emissions per capita for the entire World is 5 ton per year. The problem is that no developing county will voluntarily cut their emissions as long as the US continue to emit much more than they do. Utter rubbish. Real China and India couldn’t care less about CO2 emissions. Furthermore their per capita emissions will grow strongly in the coming decades. There only getting started. Warren, you seem to think you can read the minds of people in China and India. That has little credibility. However, you are right that especially India’s per capita emissions will continue to grow substantially. They have a good argument when they ask why Indians should not be allowed to emit just as much CO2 per capita as Americans do. So Americans emit more plant food per capita than anyone else, and this is …. bad? Klem, the claim that CO2 cannot be bad because it is plant food is a horrible argument. The problem is that although CO2 may be good for one thing, it can also have other bad consequences. One is increased vegetation growth. This may be a positive effect. Another is increased greenhouse effect. Most scientist think the outcome of this has many negative effects. A third is acidification of oceans. It is hard to see any positive outcomes from this, but we do not know how serious the negative effects are. Quite many scientists think this can be very serious. More as a curiosity, I can also mention a forth which is increased corrosion in concrete enforcement because of the carbonation effect on the concrete. There may be other “unknown unknowns”, that will turn up if the CO2 level continues to rise far above levels we have not had in millions of years. A change in pH from 8.3 to 8.2 isn’t acidifying the water. You would also have to desalinate the water first. CO2 has no effect on steel in the concrete. That is all down to O2. I have no idea where you got that CO2 causes the corrosion in the steel in re-enforced concrete but it’s wrong. The carbonation changes the chemistry of concrete, so the steel becomes more vulnerable for corrosion. It is a very well-known problem. Jan I don’t think one needs to read minds here. I think the Chinese and Indians are intelligent to see through the global warming scam in the same way that many of us here can. No one, not them and not us in the West, need care about CO2 ’emissions’ because they green the planet and do no harm to the environment. This has nothing to do with citizens of other countries measuring their use or emissions against the US. The overwhelming majority of individual Americans, Chinese, Indians or any other passenger on Space ship earth doesn’t think about CO2 emissions and those who run the governments don’t care how much they, the Politicians/bureaucrat, use, so long as they gain the power to dictate how much those not thinking about it can use. “CO2 for me but not for thee” Jan, although those complicit in peddling this global scam managed to position themselves with the bureaucratic (aka Central Planning Committee) in crowd enjoying unlimited use while lecturing (soon to be dictating) to the rest of us. Bill, you may be an American, and therefore not having the same perspective, but as a European I can tell you that this has everything to do with measuring emissions against the US. The media are full of stories day in and day out about the global warming as a serious threat, and that we should transfer to carbon free alternatives although it means higher costs. It is a hard sell when we see that those with the highest emissions per capita do not do the same. Your claim is CO2 causes the corrosion of the steel in the concrete. You forgot to mention the other “thing” needed is moisture which is stated in the linked article. Moisture permeates the “pours” of the concrete until it reaches the steel. The steel begins to rust. The rusting begins to break open the concrete exposing more steel to more moisture. And so the process continues until it fails. Steel can be coated in resins that stop this as well as a barrier of concrete that is moisture proof. Were they starting to cut emissions and go renewable (or at least planning to do so) in the wake of the Paris Accord, when the U.S. was on-board with the EU in scaling back its emissions, and when it looked as though another Democrat would be president in 2016? Being on-board with the EU in scaling back its emissions is not enough. If I were a poor Indian citizen, I would never accept that my country should transfer from cheap coal to expensive renewals before the developed nations had cut to the same level of emissions per capita as in my country. That is the natural way to think. The problem is that it may lead to a tripling or quadrupling in the global CO2 emissions. There are some who believe 350ppm/v is the “safe” concentration of CO2 beyond which is a tipping point of no return. We are currently at ~410ppm/v, and we are still here, the weather and climate are great, the oceans are still teaming with life. I expect CO2 will easily breach 500ppm/v in my lifetime and I am betting we will still be here and the climate will be just fine. There are some who believe 350ppm/v is the “safe” concentration of CO2 beyond which is a tipping point of no return. Yes, and they are wrong, they have always been wrong. IPCC have never said that 350 ppm is a tipping point, nor have they said that 500 is tipping point. However, there is a useful concept called “too much”. The level will likely not stop at 500 ppm. If all countries continues to use the cheapest energy source we are on the path of reaching 1000 ppm within a century. I didn’t say the IPCC. Jan – a few facts for you, who are clearly fact-challenged. The USA is one of very few countries that has REDUCED its CO2 emissions in the past decades. This was because of a large shift from coal to natural gas for electricity generation. Countries like Germany , Britain and others who embraced wind power have actually INCREASED their CO2 emissions, because of the intermittency of wind power and the need for ~100% spinning reserve from conventional power, to come onstream instantly when the wind dies. I am Canadian, and I object strongly to the Pavlovian anti-Americanism that is prevalent among imbecilic leftists, especially in Europe. More than any other country, the USA saved Europe from conquest by Nazi Germany and the Soviet Union. Between Hitler and Stalin, over 100 million people died, due to their extreme leftist fanaticism. After WW2, the Marshall Plan saved many more millions of Europeans from suffering and death due to deprivation. The Marshall Plan was the most generous treatment of a defeated foe in the history of humanity – that is the true legacy of the USA. When I hear this idiotic anti-Americanism from Canadian leftists, I ask them one question: “If you had your choice, which country would you rather have as your next-door neighbour? Russia? China? Germany? Japan?” They are typically struck silent, and the utterly dumbfounded look on their faces reflects their imbecilic vacuity. The CO2 emission in both Britain and Germany peaked in the 1970 tis and have afterwards have a steady decrease. According to BP statistical record of world energy, Britain peaked at 718 Mtonnes in 1973 and was down to 398 M tonnes in 2017. Germany peaked at 1112 M tonnes in 1979 and was down to 764 M tonnes in 2017. Germany has unfortunately prioritized to eliminate nuclear before coal, so their emissions have been flat since 2009, but Britain’s decline fast, much faster than the US emissions. I am not anti-american, and I agree that we Europeans should be grateful for having been rescued in both WW1 and WW2. However, this is another challenge and it does not concern only developed nations. And these sources accurately measured emissions in Britain and Germany in the 1970’s? You find links to the sources there. While Britain and Germany may have reduced CO2 emissions by switching from coal to natural gas, their widespread adoption of wind power has done little to reduce CO2 emissions – because wind power is intermittent and requires ~100% spinning reserve. The leaders of the warmest movement will feel the need to double-down on their failed predictions of runaway global warming and more extreme weather. Their followers, the warmest minions, will be in despair because it is absolutely clear that fossil fuels are not going anywhere, and will continue to comprise 85% of global primary energy for the foreseeable future. The extreme emotions wasted on blatant global warming fraud are regrettable, but there is no cure for stupid. The warmest minions will continue to suffer from their self-inflicted injuries. Yes, and one, they can only maintain that level of energy for so long before exhaustion sets in, and two, there may be a huge backlash when they finally figure out there was nothing to be worried about with the climate in the first place, and they were fooled by people who were trying to profit from instilling fear in them. One of my concerns is that school teachers have generally adopted global warming / climate change alarmism and are teaching this to their students, creating false alarm and filling these kids with leftist propaganda. While my daughter has been spared this leftist hysteria to date, I know it is a common problem in our schools. To put it simply, I don’t want anyone this stupid or corrupted teaching my kids. Anyone else look at this study and think, “HOT DOG! YES! !”…….just me? Can’t be…there are those on here that understand what it means to raise people out of poverty, to give them access to cheap reliable energy and to raise their level of basic human living. I guess the 10-children households make a difference.